Despite efforts to filter out unreliable content, this information can be considered RUMOR and subject to change or otherwise inaccurate. Season 3 spoilers are dated and will not be edited after the original posting in an effort to establish a track record (good and bad), rather than revisionist history. The webmaster's comments are found in the italicized brackets. Novacek has taken his anger out on Adama with that pipe. Full size versions along with other pics are available on drewcypher's Live Journal (Now Offline). 10/21/06: Adama participated in a covert operation against the Cylons. 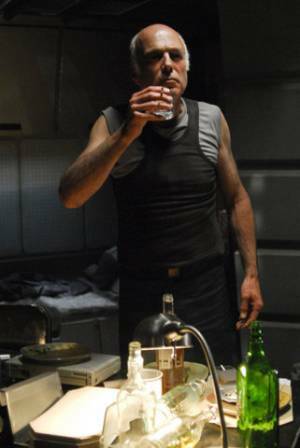 This and his shooting down Novacek led to Adama's guilt over the Cylon attacks. 10/7/06: Novacek was held for 4 years. 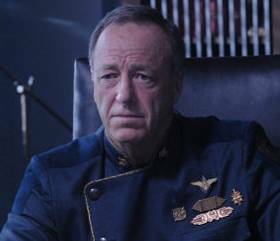 Adama shot down Novacek and believes he might have precipatated the Cylon attacks. 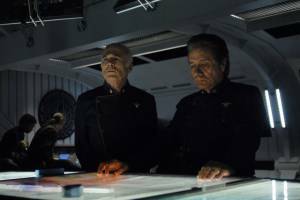 Adama and Tigh reconcile. 10/3/06: An Admiral Corman appears in flashbacks. 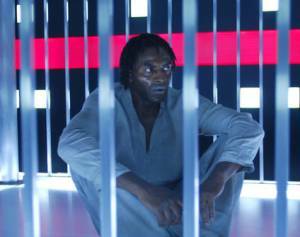 9/30/06: Carl Lumbly (Alias) portrays Lt. Novacek, the liberated POW. 9/27/06: Preliminary Episode Synopsis: In the days just prior to the Cylon attacks, Adama committed a wrong that's he's managed to keep secret. 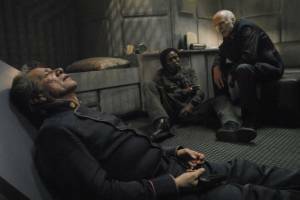 When a POW is liberated from the basestar, Adama's secret is revealed.